Dr. Bannon | StatsWhisperer | Statistics Training, Books, Videos & More! Dr. William M. Bannon, Jr., founded StatsWhisperer as a means of providing specialized knowledge regarding quantitative analysis to students, academics, professionals, as well as all other consumers and practitioners of statistical research. Dr. Bannon designed many of his teaching methods while on faculty at several New York City institutions. The diversity of these centers of education allowed him to apply these methods in several fields. Specifically, as an Assistant Professor with a dual appointment within the Department of Psychiatry and Department of Preventative and Community Medicine at The Mount Sinai School of Medicine, Dr. Bannon had an opportunity to instruct physicians and nurses, as well as medical and nursing students on quantitative research methods. Bill also served on several other faculty appointments, including those of Fordham University, Hunter College, Yeshiva University, and Adelphi University, where he taught research and statistics at the Masters and Doctoral levels. During these academic appointments, Dr. Bannon became increasingly impassioned about designing teaching and research methods that would meet two objectives. First, quantitative methods must be clear, understandable, thought-provoking, and gratifying to the learner, practitioner, or consumer of that research. Second, all quantitative research should be made fundamentally sound through adhering to a standard step by step method, which reflects that all the necessary methodological considerations have been made for that particular study. Dr. Bannon sees this as a pressing issue as decisions made within any professional field that based upon unsound research will likely result in problems at a societal level. Bill’s passion in this area has lead to his being nicknamed the “Ralph Nader of Statistics,” meaning he is concerned with public safety in relation to sound research in the way Mr. Nader was concerned with automobile safety production in the 1960s. 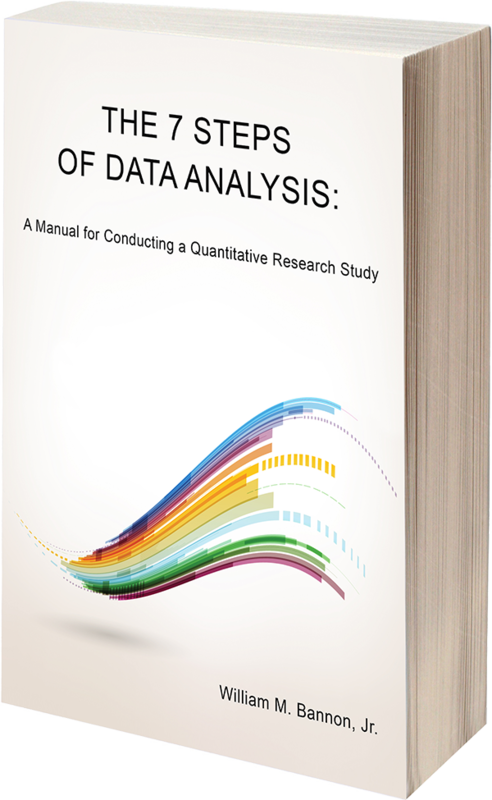 Toward this goal, Dr. Bannon wrote the textbook The 7 Steps of Data Analysis: A Manual for Conducting a Quantitative Research Study (2013) to serve as a guide for completing a fundamentally sound statistical research study. As an academic Dr. Bannon’s research is widely published and has been funded through a number of sources including the National Institute of Health (NIH) and National Institute of Mental Health (NIMH). He received his doctorate degree from Columbia University.